So I was in one of those moods where everyone gets ice cream, everyone. I have never really let Presley have rein over her own cone, but today she experienced that indulgence. 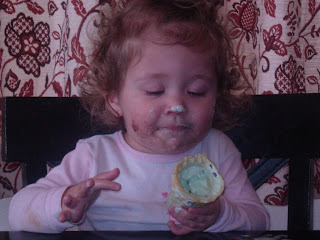 Partly because every child should experience their own ice cream cone, and partly because I was indulging in a bowl of my own. 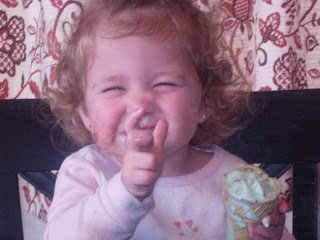 Mint chocolate chip happens to be one of my favorites, if you get a good brand, and Presley also loved it. 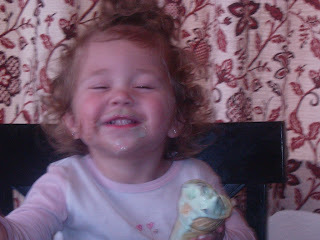 She liked to pick out all the chips and eat them with her fingers as opposed to licking them, makes sense if you ask me. 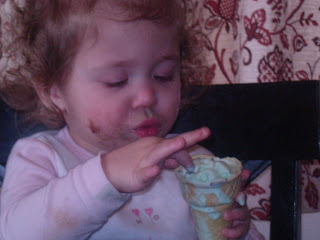 The chips are kinda different to lick, I usually have my ice cream in a bowl, so I was not opposed to her method. Lately Presley has been miss sensitive, so I didn't think this cold, wet, sticky ice cream thing would last long, but she ate the entire thing, minus half the cone, and she definatly took her time. After the first and last photos I took, she would hardly pay attention to me either. I kept trying to talk to her and ask her if she liked it and what not, but she was so busy focusing on eating this strange thing, that she payed no heed to my social butterflyness. Yep, I was ignored. Makes sense though, have you ever eaten a bowl of ice cream in utter silence, just focusing on each bite, truly enjoying what you're tasting? Trust me it's much more satisfying that way. I love ice cream with company too, but it seems like before I know it my spoon is clanking the bottom of the bowl, I don't know where it all went, I'm wondering if ice cream evaporates, and I'm swearing I got short changed on the scoops. And that only leaves me wanting more. 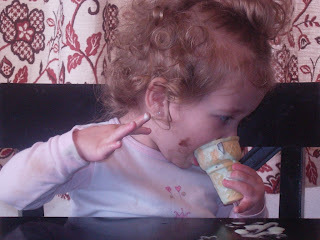 Much more theraputic to eat it in silence, so kuddos to presley for figuring this out early on. It will most definatly save her some inches to the waistline. 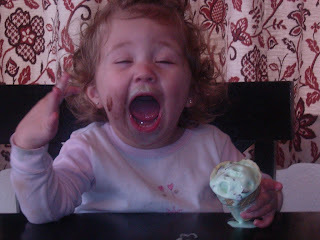 I love mint chocolate chip too- good choice. My fave brand is the breyers. She's getting so big! I loved your pics in your last post with her straight hair. I think it made her look way older. Weird how a different hairstyle can make you look like a different person! 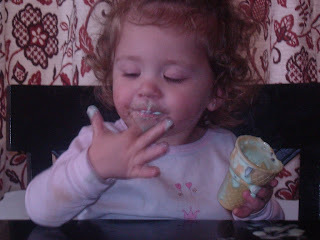 We let Garrick have some at that age and I just remember that he didn't know just how to lick and he was a mess. I can't believe how cute she is. Oh, and she does look completely different with straight hair.